All the RESFARM members met in Santiago de Compostelaon the 21st and 22nd June with the aim of deciding on the most suitable alternatives for technology, financing and justice. The main aim of this meeting was to provide the most cost effective development and maintenance, and the common cash flow from the renewable energy facilities on farms. On the first day of the event, the survey’s results and the interviews carried out in the project’s first phase were analised, along with the most appropriate RES technology for the project. In the afternoon of the first day, the most suitable financial tool was debated and chosen by all the consortium members. The financial tool, basedon a TPO-PPA,was chosen and, through using this financial tool, investors will have the opportunity to show profit by running a standardised and transparent financial product.Likewise,farmers will be able to gain access to the necessary resources for financing their facilities, both with planning and control of facility maintenance costs. On the event’s second day, a press conference was attended by the national press. 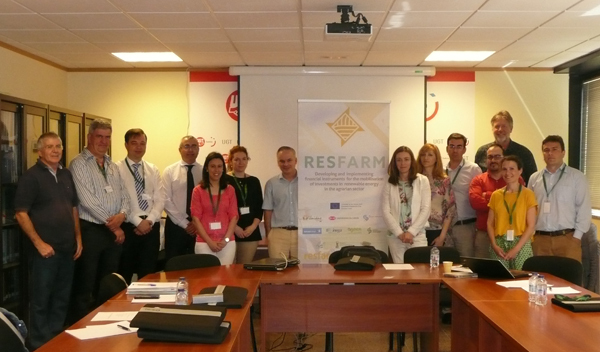 In this conference the chosen financial tool and the advances achieved so far by the RESFARM project were explained. Unión Agrarias, UPA representing the farmers, the University ofACoruñaas the researchers and Research4Life as the technology specialists took part in the press conference. The meeting was vitally important to the project’s frameworkbecause the advances and achievements throughout the first phase were outlined and, indeed, these achievements have allowed for the project’s second phaseto begin. In the project’s second phase, the financial tool, which will allow farmers access to the installation of RES on their farms, will mean access to the necessary financial resources to finance such facilities.